Giulio Palermo is admitted to the Bars of Rome, Madrid and Geneva and specializes in international arbitration. He acts as counsel and arbitrator and has been involved in over thirty international arbitrations in English, Spanish, Italian and French, under numerous applicable laws and across different industries. 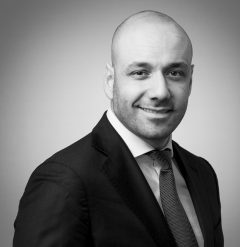 Giulio also practices cross-border litigation with a special focus on enforcement of foreign judgments and court proceedings related to arbitration, and advises companies and individuals on contractual and commercial matters. Giulio lectures international arbitration in several European universities and is currently President of the Italian Chapter of the Club Español del Arbitraje and Co-Chair of the Club Español del Arbitraje menos 40. He is a past Co-Chair of ArbIt (the Italian Forum for Arbitration and ADR) and Regional Representative of the Young Arbitrators Forum of the ICC.